The following is an article from Uncle John's Legendary Lost Bathroom Reader. In the early 1950s, Senator Joseph McCarthy had Americans believing that Red Agents were infiltrating the U.S. government. the result was on of the biggest witch hunts in American history. But according to It's A Conspiracy! by The National Insecurity Council, McCarthy lied. Here's the part of the story you may not have heard. On February 9, 1950, Joe McCarthy, a rumpled, ill-shaven junior senator from Wisconsin, made a Lincoln's Birthday speech to a Republican women's club in Wheeling, West Virginia. No one -not even McCarthy- considered it an important appearance. Yet that speech made Senator Joe McCarthy the most feared man in America. Waving a piece of paper before the group, McCarthy declared, "I have here in my hand a list of 205 names made known to the Secretary of State as being members of the Communist party, who are nevertheless still working and shaping policy in the State Department." Republicans had been calling Democrats Communists for years. But before this it had just been political name-calling -no one had claimed to know exactly how many Communists were supposedly in the government. This was a paranoid nation's worst nightmare come true; McCarthy's speech made headlines. By the time he had given a similar speech in Salt Lake City and returned to Washington, D.C., newspapers from coast to coast had repeated his charges as fact and the country was in an uproar. The McCarthy Era -an American inquisition that ruined the lives of thousands of innocent citizens accused of being Communists, Communist dupes, or Communist sympathizers- had begun. * Although he never substantiated his charges, McCarthy's influence grew rapidly. As chair of the Permanent Investigations Subcommittee of the Senate Committee on Government Operations, he presided over a witch-hunt for Communists. Americans from all walks of life were challenged to prove their loyalty in an atmosphere of panic and paranoia. * Fear became his most potent weapon. "Many of those who came before McCarthy, as well as many who testified before the powerful House Un-American Activities Committee (HUAC), were willing to point fingers at others to save their own careers and reputations," writes Kenneth Davis in Don't Know Much About History. "To fight back was to be tarred with McCarthy's 'Communist sympathizer' brush... In this cynical atmosphere, laws of evidence and constitutional guarantees didn't apply." * For four years, McCarthy was as powerful as anyone in Washington. He forced President Eisenhower to clear appointments through him; the president even instituted loyalty programs for people in government, to prove that he, too, was tough on Communism. * Early in 1950, McCarthy told friends he needed a gimmick to get reelected. he was in political hot water with voters because he had introduced no major legislation and had been assigned to no important committees. Newspaper correspondents in the capital had voted him "the worst in the Senate." * According to Frederick Woltman, a friend of the senator's, McCarthy had made up the number of Communists on the spur of the moment during his Lincoln's Birthday speech -and had just as promptly forgot it. Caught off-guard by the outcry, McCarthy and his advisors racked their brains for some lead as to what he had said in the Wheeling speech. "He had no copy ...he could not find the notes... the Senator's staff could find no one who could recall what he'd said precisely." * That may be why every time McCarthy counted Communists, he came up with a different number. The day after the Wheeling speech, he changed the number from 205 to 57 "card-carrying Communists." A week later, he stated before a Senate Foreign Relations subcommittee that he knew of "81 known Communists." The number changed to 10 in committee hearings, 116 in an executive session, 121 at the end of a four-month investigation, and 106 in a June 6 Senate speech. When asked, "Joe, just what did you have in your hand down there in Wheeling?" McCarthy gave his characteristic roguish grin and replied, "An old laundry list." * He was able to keep up the charade for so long because he would attack anybody who questioned his accuracy. For example: When the majority leader of the Senate asked if the newspaper accounts of his Wheeling speech were accurate, McCarthy replied indignantly, "I may say if the Senator is going to make a farce of this, I will not yield to him. I shall not answer any more silly questions of the Senator. This is too important, too serious a matter for that." * According to Curt Gentry in J. Edgar Hoover: The Man and the Secrets: "On returning home from his speaking tour, McCarthy called J. Edgar Hoover and told him he was getting a lot of attention on the Communist issue. But, he admitted, he had made up the numbers as he talked ...and he asked if the FBI would give him the information to back him up." William Sullivan, who later became third in command at the FBI, protested that the Bureau didn't have sufficient evidence to prove there was even one Communist in the State Department. * Hoover -completely ignoring the FBI's charter- assigned FBI agents to gather domestic intelligence on his ideological enemies, poring over hundreds of Bureau security files to help support McCarthy's charges. According to Gentry, Hoover did even more: "He supplied speechwriters for McCarthy ...and instructed him how to release a story just before press deadline, so reporters wouldn't have time to ask for rebuttals. Even more important, he advised him to avoid the phrase 'card-carrying Communist' which usually couldn't be proven, substituting "Communist sympathizer' or 'loyalty risk.' which required only some affiliation, however slight." When McCarthy began attacking Eisenhower and the army in 1954, Hoover sensed that his own job might be in danger and ordered FBI aides not to help the Senator further. Poorly prepared, McCarthy tried to bluff his way through the televised army hearings, but this time he failed. Americans saw him as a bully and a liar, and the press turned on him. In December 1954, McCarthy became the fourth member in history to be censured by the U.S. Senate. 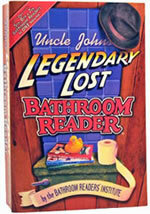 The article above is reprinted with permission from Uncle John's Legendary Lost Bathroom Reader. What goes around comes around. Earlier this month Congressman Allen West told a town hall meeting 'I believe there's about 78 to 81 members of the Democrat Party who are members of the Communist Party. It's called the Congressional Progressive Caucus.' And he isn't backing down from his statements either. This is an amazing collection of all the slanders and lies aimed at whistleblower Joe McCarthy. If you believe Julian Assange, Daniel Ellsberg and Bradley Manning did the right thing one must support McCarthy. If you think those 3 were dangers then you can include Joe as well. The key here is all the info is pre- fall of the Soviet Union. The tip off is there is no mention of The Pond, the secret agency that gave Joe the list of names. Nor is there any mention that the names came from a rogue head of the KGB. Nor that the names mentioned pop up in KGB files after the fall- all but one that is. So many lies and CIA spin here where do you start? Only one reporter stated a number at the Wheeling speech he said Joe said. Under oath, in a libel suit, that reporter confessed Joe gave no number. As did a Senator who claimed to have a recording of it.http://www.facebook.com/photo.php?fbid=10150414012065986&l=9f46ad3e15 Who started the rumors about Joe looking for a gimmick, etc? A Soviet spy- http://www.facebook.com/photo.php?fbid=10150244708835986&l=dcb7b2e394 What about the newspaper reporter who destroyed Joe? A CIA agent. http://www.facebook.com/photo.php?fbid=10150474761060986&l=9345150677 For years FDR did nothing to remove spies in our government, which were in numbers far beyond 200. This was not an issue until Stalin cancelled elections in Central Europe, China went communist and the Korean War began. 81 Nazi's had been smuggled through Mexico as Mexican laborers to work with Werner Von Braun on our missile program. This was against international law. The CIA was afraid Joe would discover this. Absolutely nothing written about McCarthy before the fall of the Soviet Union can be trusted. Nothing. He was naive only in that he did not realize the overwhelming forces aligned against him. There is no Soviet Union to protect anymore. Stop spreading nonsense. Every one knows nazis worked on our space program. It is past time to stop the nonsense. Google CIA THE POND. You will discover the CIA confessed to giving Joe one fake name to discredit him. A full confession that nothing was done to remove spies. The above is not theory. It is not guessing intentions. It is all from declassified documents- and the CIA's full confession. They have meddling in domestic issues since day one, which is against their own charter. The group should be ended. And their smears need to stop being repeated. Do you have any sources that aren't your own Facebook posts? Nick - Mr West said "I heard", not "I believe". And such is life today that we've all "heard" a widely and wildly varying amount of drivel, so that much is likely true.